I was honored and most grateful for receiving the Lillian Tabas and the Legacy Fund of Bnai Aaron for the gift certificates to Walgreen Pharmacy. They were a great help in subsidizing my monthly medication bills. A special thanks to Francine Bernstein for recommending me to this program. Bless you all. H.G. I was so moved by the generous gift card. The gift that the Female Hebrew Benevolent Society gives for those of us that are in unfortunate circumstances is so wonderful. I have thoroughly enjoyed your gift and it has made a difference in my life. Thank you for all you do and continue to do for others. Many thank. H.R. H.G. and H.R. are two of the 19 women assisted during the second cycle of FHBS’s Pharmacy Stipend Program. The Legacy Fund of SJCC Bnai Aaron made this possible with a grant in the amount of $5,100. Renewed funding for a third cycle enabled us to expand our reach to include 27 women, 11 renewals and 16 new clients. The $7,800 received was augmented by a $300 gift from one of our emerita board members providing a total of $8,100 with which to work. Referrals came from Jewish Family & Children’s Service, divisions of Counseling and Care Management and Senior Services, and the Heart to Heart Program at Klein JCC. Nine of the 27 women are new to FHBS; 19 have been assisted in prior years but are new this fiscal year. All are accessing public benefits. They range in age from 48-93. Four are married; nine are divorced; four are single; one is separated and nine are widows. Eighteen of these women live in Philadelphia with the others are scattered throughout Bucks, Delaware, Eastern and Western Montgomery Counties. Seventeen live alone; nine live with a spouse, minor or adult child. Primary sources of income derive from Social Security (20), SSD (2), pension (2), alimony (2). One client had no income at the time she was referred to the program. Federal Poverty Guideline rankings are: 100% or below (4); 150% or below (8); 250% or below (14); 300% or above (1). Eileen Sklaroff, President, FHBS, and board member Tamara Chasan Pomeranz are administering this program. Helen is a 90-year-old widow whose monthly income of $853 derives from Social Security and Food Stamps. She ran an antique jewelry business in Center City with her late husband; they raised two sons. Helen has multiple health issues including circulatory problems, depression and loss of appetite. She is homebound and mostly bed bound because she has to keep her legs elevated. FHBS is providing a Personal Emergency Response System and a $50 pharmacy stipend for a six-month period. We have never given her any other kind of aid. One of Helen’s sons was murdered in his place of business many years ago. Her home was in the son’s name, and upon his death his wife forced her to move out. Helen lived in subsidized senior housing for seven years while she and another son, Jonathan, went to court to regain the property. They finally succeeded, and she returned to live there by herself while Jonathan lived with his girlfriend and worked in suburbs. Everyday Jonathan came to Helen’s home before and after work to prepare her meals and help with chores. The trip took about 45 minutes each way. He also helped with household expenses. Then he was diagnosed with stage four lymphoma. As a result, his girlfriend walked out, and he lost his job. The girlfriend has a daughter, who was like a granddaughter to Helen, so the break up had an emotional impact on her as well. Jonathan moved in with his mother. He holds hope that he will survive the cancer so he tried not to cash his 401K. But the household bills, which amount to almost $3,000/month, forced him to do so. He has approximately $5,000 remaining. If Jonathan dies, Helen will have to move to a nursing home because she needs daily care, and there will be no one to provide it. Words cannot express the gratitude one feels when (some-one reaches out) aid comes at the time misfortunate is at it’s worst. If I survive this dreadful winter, on May 25, 2014 I will have reached 90 years. My only existing relative is my son Jonathan. (a loving caretaker) Unfortunately he has lymphoma – I live in fear. Once more I must thank you. There is delight in being aware that a helping hand was there. 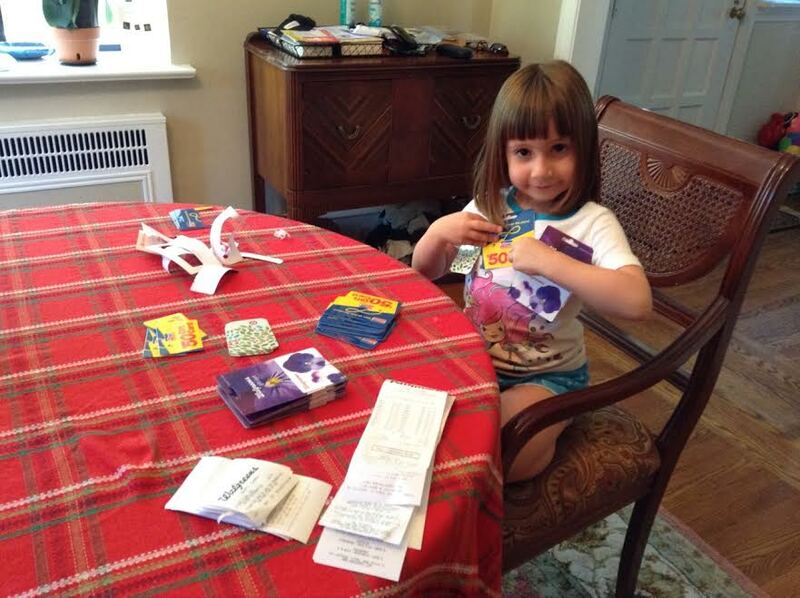 With a heart that is full, Helen W.
Rebecca Pomeranz, daughter of board member Tamara Chasan Pomeranz, helps prepare gift cards for participants in the Pharmacy Stipend Program.